Ilan Volkov is an adventurous and internationally admired conductor. He is also creator and artistic director of Tectonics, a unique two-day immersion in the clashing of musical genres that is intended to catalyse new musical forms and directions. Tectonics Adelaide 2016 is the 14th Tectonics event held worldwide, and the second to be held in an Adelaide Festival. 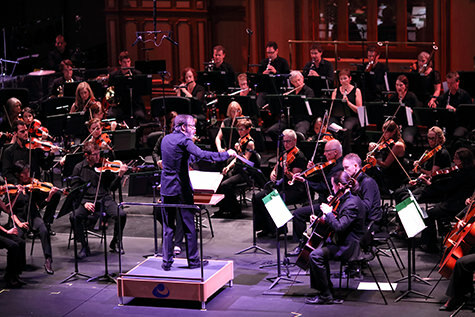 For his 2016 program, Volkov focused on “new orchestral, chamber, electronic and improvised music and its contrasts” and the spatial and acoustic properties of the Adelaide Town Hall, where it was staged. It was also a visual experience, with some composers using video in their work. By commissioning new kinds of work for Tectonics, Volkov expands music’s frontiers. He invites each city’s resident orchestra to experiment with improvisation and graphic scores, to work with ensembles and performers not typically associated with orchestras and, with guest performers, to use the formal space of the concert hall flexibly and experimentally. The 21 members of Sydney’s Splinter Orchestra mingled with the crowd, spending 70 minutes slowly, gently, sometimes imperceptibly making all kinds of sounds and exploring the acoustic properties of the Town Hall’s gracious entrance, with its marble staircase and ornate high ceilings, in a work appropriately entitled Air Hockey. 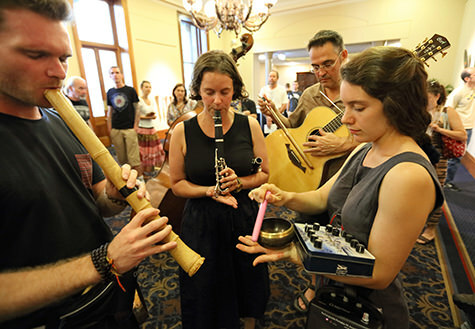 We heard Splinter’s typically modified, improvised and symbolically suggestive instruments, such as a length of hose-pipe, a sax with a drink bottle stuffed into its bell and an electric guitar scraped against the stairs. A vocalist ascended the stairway performing slow-motion mime gestures. 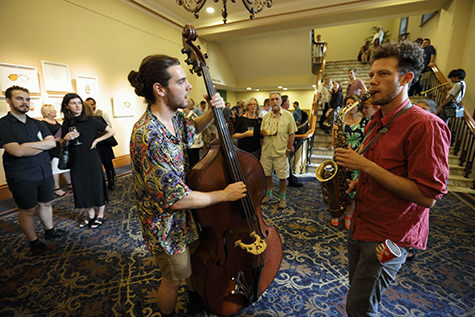 Ambient sound became part of the mix, as some performers moved onto the external balcony overlooking Adelaide’s main thoroughfare, their sounds competing with traffic noise. By the work’s end, everyone had drifted into the auditorium, our sonic, visual and architectural awareness refreshed. The Adelaide Symphony Orchestra under Volkov then performed Annie Hui-Hsin Hsieh’s In Talentum of Light. The stage had been extended well into the auditorium to accommodate the vast instrumentation required for the ASO’s performances, and for Hsieh’s work, there were additional players in the balcony and numerous percussionists located around the space, so that the sound came from all directions. A powerful work, it ends with the orchestra members playing wine glasses to produce a high-pitched shimmering sound. Composition with glass objects is an ongoing interest of the composer. In Berlin-based Australian composer Cathy Milliken’s selection of exquisite songs for mezzo soprano and orchestra, Jessica Aszodi was an engaging soloist. The work sets texts ranging from Sophocles to Hollywood movie scripts. US composer Jim O’Rourke’s Come Back Soon for orchestra was a lighter work with a metronomic rhythm that exemplified a recurring theme permeating this year’s programming, that of time. The remaining works of the evening were all lengthy and unstructured, inducing us to surrender temporal awareness. In 2014, Volkov conducted the orchestra in two quasi-improvisations with soloists, one with Jon Rose (violin) and the other with Oren Ambarchi (guitar/electronics). This time Volkov brought improvising jazz trio The Necks together with the ASO and also added Speak Percussion, creating an experimental composite of three ensembles, each with a unique musical sensibility. Necks bassist Lloyd Swanton led the untitled set with a quiet, deliciously seductive bass riff on which The Necks’ other members and Speak began to build. With his back to these musicians, Volkov conducted the orchestra using hand gestures and printed signs, with the ASO members playing from graphic scores. The music slowly evolved as the players introduced motifs taken up and developed by other players—at one point, a riff that the flautist had developed was taken up by Chris Abrahams on the piano. For 40 minutes they made magic, with Speak wonderfully enlarging on Tony Buck’s imaginative percussion and the orchestra expanding the depth, colour and sonority of what was essentially Necks-style music. Reinforcing the musical potential of a large, improvising ensemble, Splinter then delivered a gorgeous set entitled Microphony, instinctively blending timbres, pitches and textures. They performed off-stage and in the dark, focusing our awareness on the sound heard in stereo over the PA. Splinter’s apparently anarchic playfulness belies the ensemble’s highly sophisticated sense of musical form and a performative approach that generates a unique aesthetic. To play like this, the musicians must first perfect the art of listening—to each other. The Necks and Splinter Orchestra have both proven that leaderless democracies can work if everyone listens appreciatively and co-operates. The evening closed with legendary US minimalist composer Phill Niblock’s dramatic work Vlada, performed by Eyvind Kang on viola with electronics. The sound gradually built polyphonically until it reached the proportions of a cathedral organ with all stops out, saturating us with harmonics and microtones. David Shea’s The Trading Routes, for guzheng (Mindy Meng Wang), percussion (Speak), and keyboard, electronics and video (Shea), is inspired by stories of the Silk Road, with Shea’s video showing images of Buddha statues, ancient wall-paintings from caves along the Road and movie clips unfolding like a stream of consciousness. Together with his overtone singing, the sounds of the guzheng, ringing Tibetan bowls and the percussive whisper of poured rice, Shea’s composition suggests a deeply personal encounter with cultural history. TQF4M1 was the title of a 25-minute set by five Splinter Orchestra members and TQM4F1 that of a set by five other Splinter members. With their absence of formal development, these enchanting improvisations again dissolved time. Some quirky instrumental elements included Jim Denley placing a ping pong ball on a tube pushed into his sax, the ball floating on his breath as he played. US soprano Jessika Kenney’s wordless, vocal solo ONSDV (the acronym was not explained in the program), accompanied by her own video work, was for me the highlight of this Tectonics program. As her looped video shows an idyllic garden scene, the 25-minute work opens with Kenney singing sustained notes on a single pitch before descending from the stage and slowly moving around the auditorium. As she moves, we notice subtle shifts in the sound caused by her changing location. Her voice becomes emotional, sometimes distressed, sometimes squealing or rasping, and there are microtonal changes in pitch. A taped voiceover in another language emerges part-way through, as if a speech has inadvertently intruded into the mix. The work concludes with the sound of Kenney breathing heavily. The eternally repeating video may be a metaphor for life on Earth while her subtly changing voice suggests the fortunes of an individual life within it. French bassoonist Dafne Vincente-Sandoval performed a second, untitled, Niblock work, similar to the composer’s earlier piece, with a single monotonal line growing into an overwhelming polyphony. Niblock’s captivating video of flowers in close-up accompanied it, the camera entering the flowers to reveal their fragile structure in micro-detail, perhaps a metaphor for the exploration of sound itself. Speak Percussion then enthralled us with a quiet but intense 40-minute work, The Moon in a Moonless Sky (Two), by Austrian composer Klaus Lang. The four members of Speak, again sonically exploring the space, played instruments at nine points around the auditorium. The Arcadia Quintet (flute, horn, oboe, clarinet and bassoon), which is rapidly making a name for itself in Australia, gave us the world premiere of Eyvind Kang’s Divertimenti, a vibrant work commissioned for them. Arcadia was then joined by Speak and Jessika Kenney for Kang’s The Mathematical Sciences Are Not the True Sciences, also commissioned for Tectonics—a 30-minute setting of texts by controversial Renaissance philosopher Giovanni Pico della Mirandola. Proceeding with mathematical precision, including one section in which four percussionists robotically play maracas, this work of Kang’s is more cerebral than his voluptuous Divertimenti. In the final sessions of the evening Papaphilia (Fjorn Butler) pumped up the volume with her Disciplined Monad, for electronics, to which many in the audience danced, followed by a brooding work for laptop by Nik Kamvissis and a long improvisation entitled A New Hedge for guitars and electronics by Oren Ambarchi and Tetuzi Akiyama. The range of music in a Tectonics program will not be to everyone’s taste—during the 12 hours of performance, audience members come and go—but the curation is artistically adventurous and offers sustained exploration of musical ideas. David Sefton has programmed some wonderful new music during his time as Adelaide Festival Artistic Director and is to be congratulated on bringing Ilan Volkov and Tectonics to Australia.